As soon as I took a taste of that creamy frozen custard I knew that I wanted to create something special with it. Would it have been great plain, in a shake, or with my homemade hot fudge? You bet! 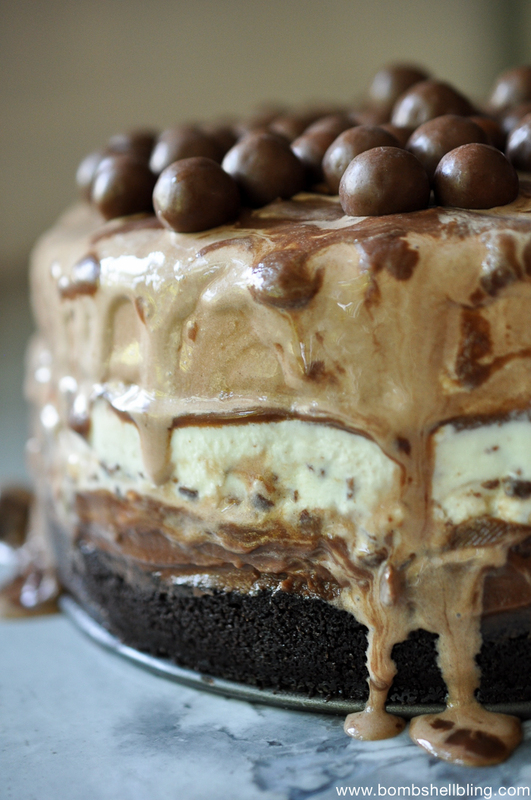 But it’s summer and I wanted to go all out, so this Chocolate Malt Frozen Custard Cake was born. You are going to be surprised by how simply it all came together. If you wanted to simplify the process even further you could use store bought hot fudge sauce, but I love my homemade hot fudge sauce, and it’s very easy to make, so I used it. Let’s walk through the steps and then I will lay out the specifics below in a compact format for you. 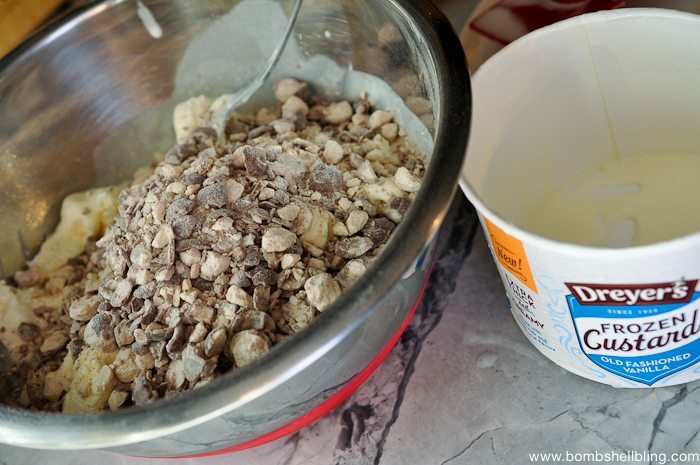 Begin by making a chocolate cookie crust. Use a food processor to crush up chocolate sandwich cookies and to mix the crumbs together with melted butter. Press that combo into the bottom of a 9″ springform pan and bake at 350 degrees for about 8 – 10 minutes, or until fragrant. This just firms it up a bit. As your crust cools, make some hot fudge sauce. Allow it to cool. 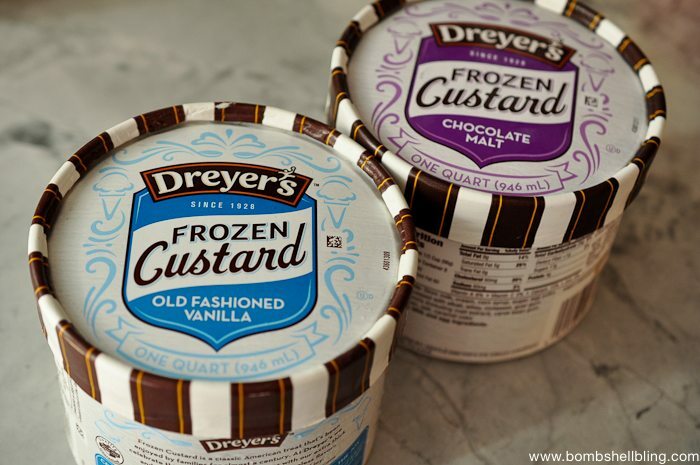 Take out the DREYER’S Frozen Custard Old Fashioned Vanilla and allow it to soften enough to scoop it into a bowl. Fill a quart sized ziploc bag most of the way with malted milk balls. Seal the bag, crush them up by pounding on them with a rolling pin, and mix them into the custard. Spread the custard and malt ball mixture over the cookie crust and the hot fudge, cover it with plastic wrap, and place it in the freezer to refreeze completely. It took several hours for mine to refreeze. 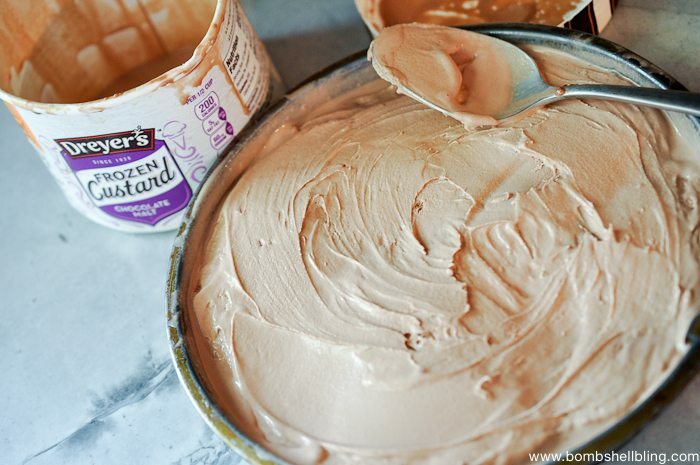 Soften the Chocolate Malt Frozen Custard just enough to scoop it into a 9″ cake pan and smooth it out. Cover with plastic wrap and refreeze. Once the layers of custard have refrozen, spread hot fudge sauce over the vanilla layer. 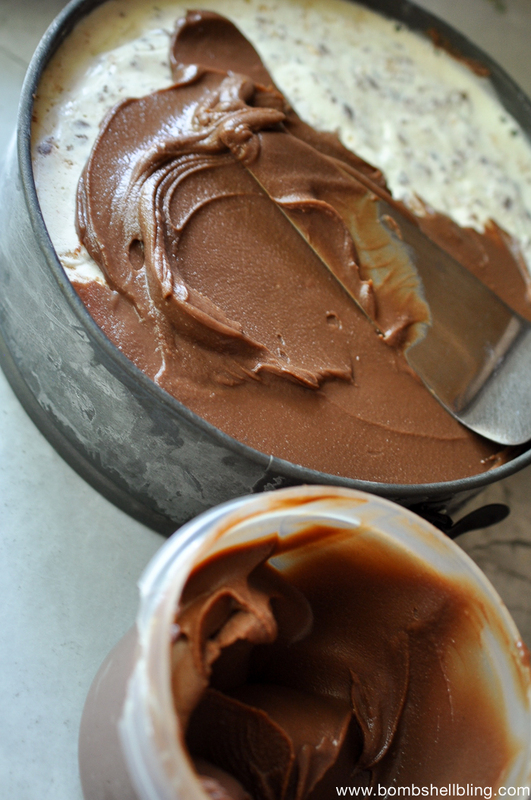 Carefully loosen the chocolate layer and place it on top of the vanilla layer. 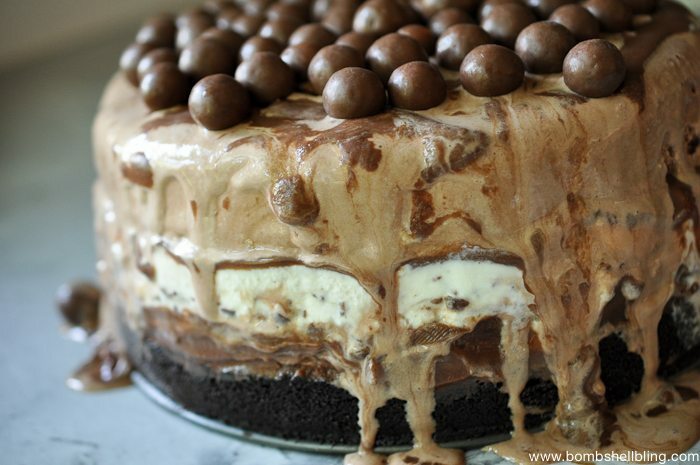 Top with more hot fudge and malted milk balls. Remove the sides of the springform pan and either refreeze or serve immediately. 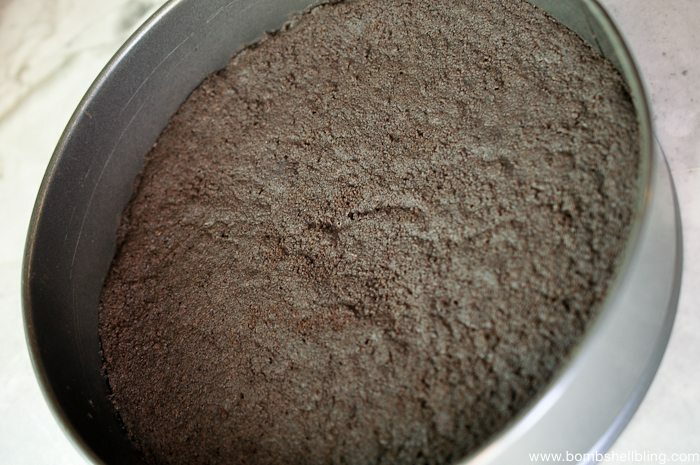 Begin by making a chocolate cookie crust. Use a food processor to crush up the 16 chocolate sandwich cookies. 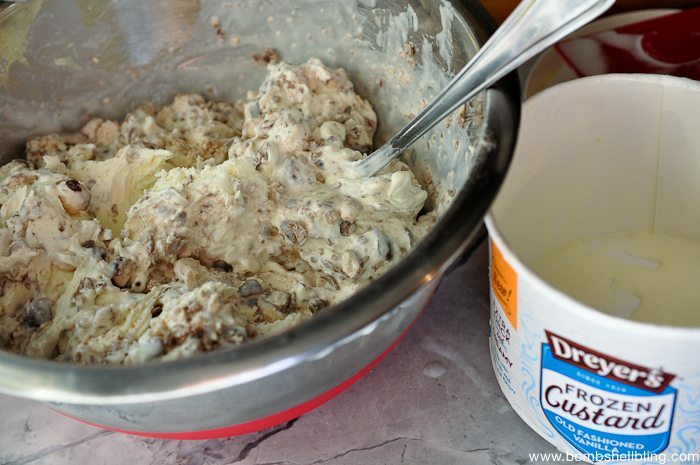 Melt 4 Tablespoons butter and mix it together with the crumbs to moisten them. Press the buttery cookie crumbs into the bottom of a 9" metal springform pan and bake at 350 degrees for about 8 - 10 minutes, or until fragrant. As your crust cools, prep your hot fudge sauce. If you make it yourself, allow it to cool prior to the next step. 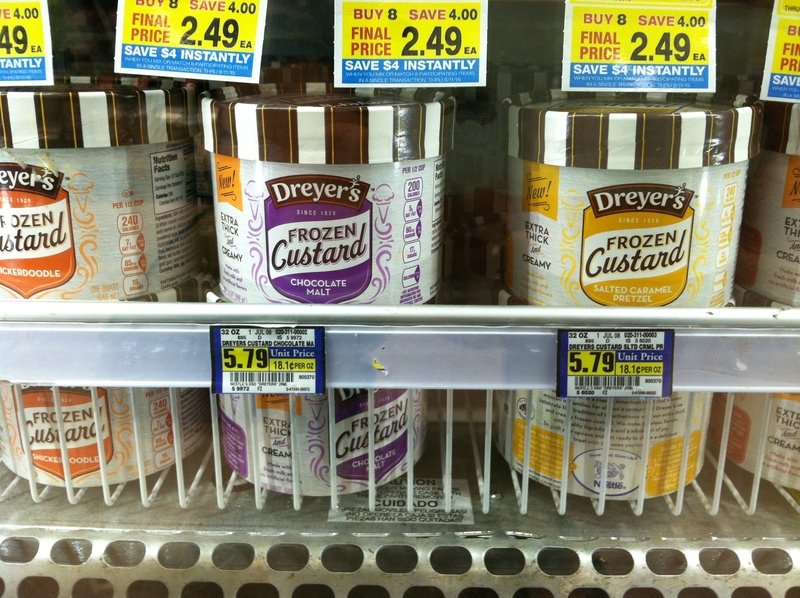 Take out the DREYER'S Frozen Custard Old Fashioned Vanilla and allow it to soften enough to scoop it into a large bowl. 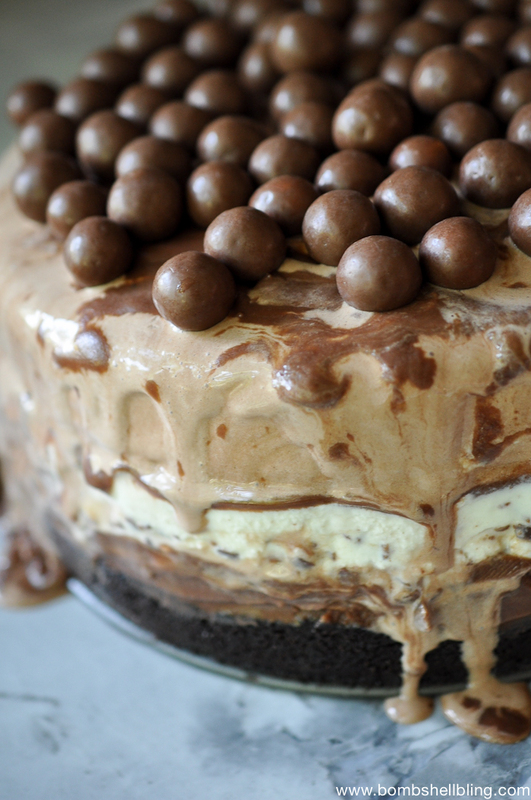 Fill a quart sized ziploc bag most of the way with malted milk balls (1-2 cups). Seal the bag, crush them up by pounding on them with a rolling pin, and mix them into the custard. Soften the Chocolate Malt Frozen Custard just enough to scoop it into a 9" cake pan and smooth it out. Cover with plastic wrap and refreeze. Once the layers of custard have refrozen, spread hot fudge sauce over the vanilla layer. 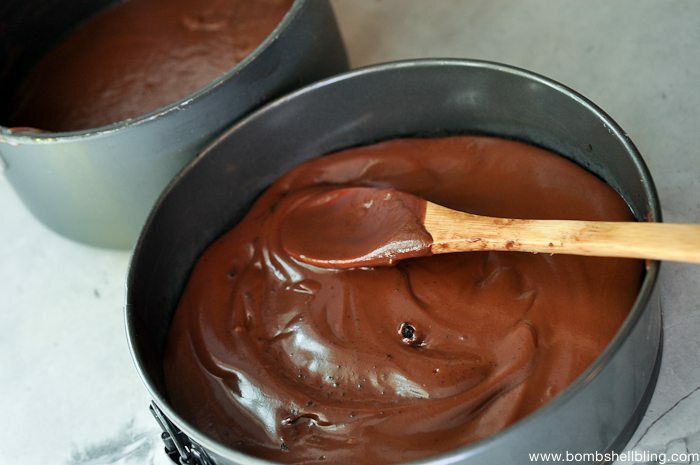 Carefully loosen the chocolate layer and place it on top of the vanilla layer. 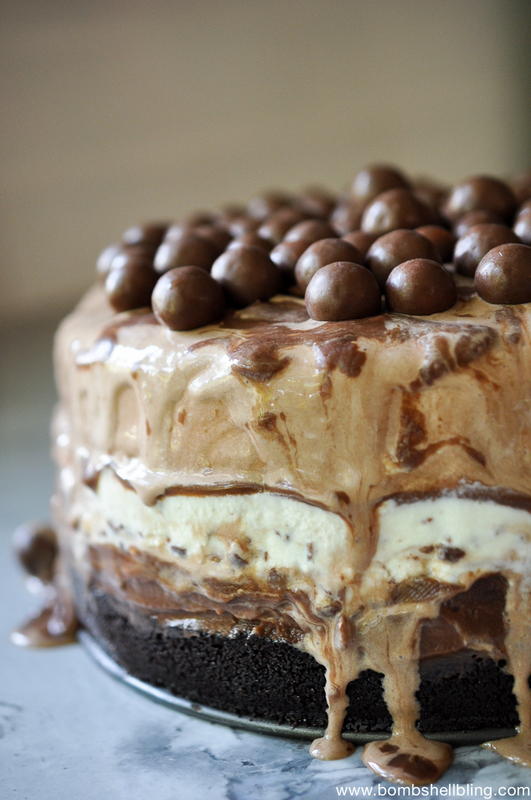 Top with more hot fudge and malted milk balls. 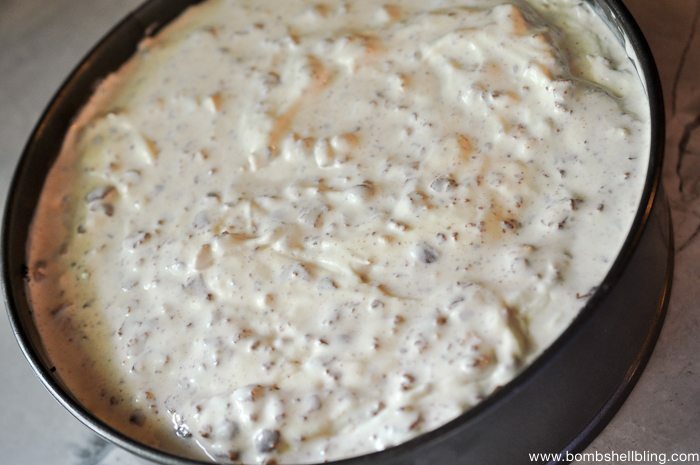 Remove the sides of the springform pan and either refreeze the frozen custard cake or serve immediately. This looks so tasty! 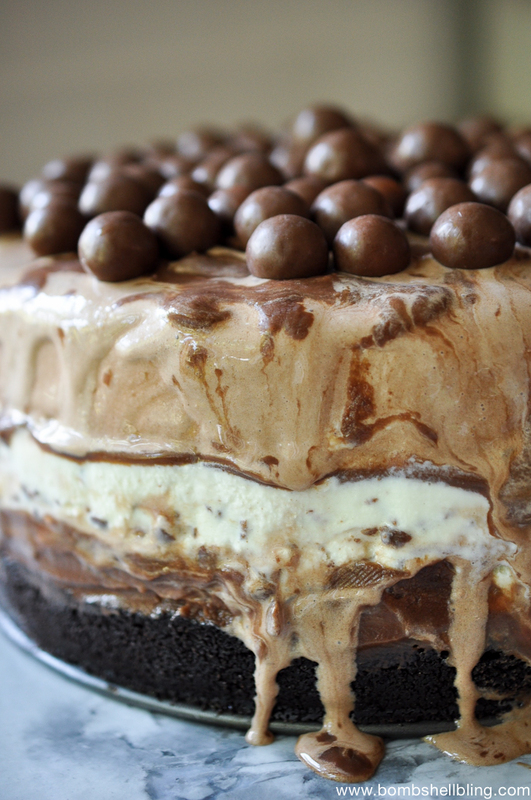 My husband LOVES malt balls, so I foresee making this in the very near future! Found you via A Simple Pantry’s link up! Wow! This looks amazing. Layer upon layer of deliciousness! Thanks for sharing on Snickerdoodle Sunday. Pinned and Tweeted. Wow…I think I just gained 5 lbs looking at the pics 🙂 I chose this as my fav from last week’s Teach Me Tuesday linky party. It will be featured this week starting Monday 7pm CST.